Redshirt sophomore Dylan Carl needs help. The 6-foot-11 forward is tasked with playing 24.8 minutes a game on average and going against the big man from every team. He doesn't score much, but his rebounding and passing are crucial to this team. It's safe to say the team's at a disadvantage when he's not on the floor. Insert sophomore Cam Benford into the lineup. The 6-foot-8 "funny guy" of the team seems to have a lot of potential. 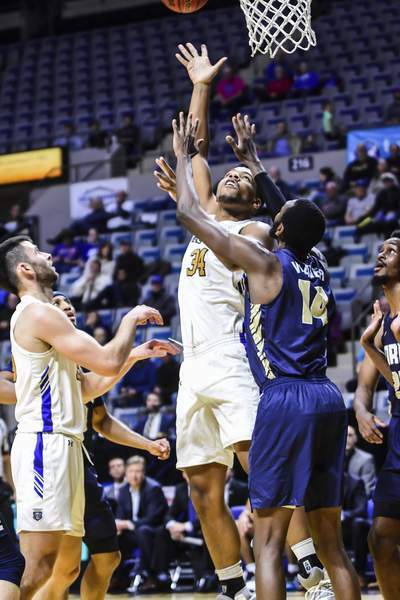 He had one of his most effective nights Thursday in Purdue Fort Wayne's 94-69 win over Oral Roberts. He scored on an and-1 to make it 24-18 halfway through the first half and finished with five points and four fouls in 12 minutes. "He's got an unbelievable motor," Coach Jon Coffman said. "He's so intent on listening and wants to please. He's every coache's dream with that." But foul trouble plagues him. He picked up his first within one minute of entering the game. "He's an unbelievable offensive rebounder, but he just has a knack for getting quick fouls," Coffman said. Coffman said Benford is a big help to Carl in getting him mini rests, but if they could up Benford's minutes a little more it would be ideal. Both are just sophomores, so there's plenty of time for the big men to find a happy balance and increased production.